Valentine’s Day is here. The holiday when heart-shaped packages of chocolate are everywhere, constantly calling out to our kids. I get it. Chocolate is probably the purest (and most delicious) form of joy on this earth. If I had a bucket full of it, I’d be wildly trying to devour it all too. Candy is a fun Valentine’s Day tradition, and you can still allow your kids this one day to transform into sugar-filled Tasmanian devils—but you might also see the holiday as an opportunity to teach them about love. 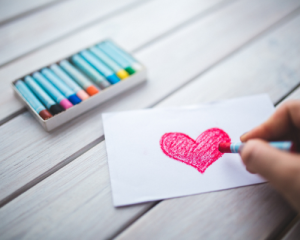 We’ve compiled a short list of five things you can do on Valentine’s Day, and throughout the month of February, to show your kids what love looks like. 1. Write love letters—to everyone! The sweetest gift you can give your kids (well, other than candy) is a note telling them how much you love them. You can even go a step further and have your kids write a note to their sibling, friend, or another important person in their life. Make simple valentines together and help them write out specifically what it is that they love about that person. If your child is too young to write, they can dictate their thoughts to you. Or their babbling. Don’t forget to sign with a heart! This is a great way to get your kids thinking about practical ways to show love to others. And it’s simple. Just write some different loving actions on blank notecards, and have your child pull a card and silently act it out while the rest of the family guesses the action. So many places in Chicagoland could use your help this month. So why not help your kids use their energy to practice kindness? Chicago Cares is a great place to find volunteer opportunities. You could also put a jar on your kitchen table, and all through the month of February you and your kids could collect spare change together to give to an organization like A Giving Heart Foundation—a Chicago-based foundation helping children with heart disease—or another worthy heart-related charity. Whatever you do will be a great opportunity to get them interacting with those who could really use some compassion. 4. Read love stories… or tell your own! From The Giving Tree to The Runaway Bunny, there are hundreds of children’s books out there whose stories center on themes of love and kindness. And chances are, you already have a few lying around the house. If not—check out your local library. Then cuddle up with your little ones and read a story together. Or better yet—tell them your own story about a time in your life when you’ve felt loved or been treated kindly. 5. Show love with a heart braid. If you’re looking for a truly unique Valentine’s Day activity to do with your kids, stop by KidSnips and get a $10 heart braid. 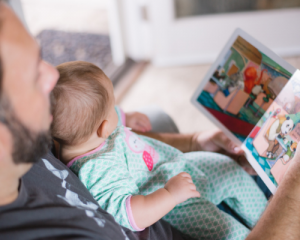 It’s fun for both of you, and you can use it as an opportunity to spend some quality time with your little ones and tell them just how much you love them! Come into any KidSnips to get your heart braid done for $10—and don’t forget to mention this offer when you call to book your appointment. PLEASE NOTE: Heart Braid offer valid through February 28, 2019. Not valid with any other offers.